Other honors for Pounder include an Emmy® nomination for her role as Dr. Angela Hicks on the NBC series ER and an Emmy® nomination for her role in FOX’s The X-FILES. In addition, she received a Grammy® Award nomination for “Best Spoken Word Album” for GROW OLD ALONG WITH ME, THE BEST IS YET TO BE and won an AUDIE, the Audio Publishers Association’s top honor, for WOMEN IN THE MATERIAL WORLD. Film credits include HOME AGAIN, RAIN, PRIZZI’S HONOR, POSTCARDS FROM THE EDGE, ROBOCOP 3, SLIVER, TALES FROM THE CRYPT: DEMON KNIGHT, FACE/OFF, END OF DAYS, MORTAL INSTRUMENTS: CITY OF BONES, ORPHAN, AVATAR and her breakout role in BAGDAD CAFÉ. A graduate of Ithaca College, she received an Honorary Doctorate of Fine Arts from the school and was their 2010 Commencement Speaker. Pounder serves on the Board of the African Millennium Foundation and was a founding member of Artists for a New South Africa. An advocate of the arts, recent accolades for Pounder include the Visionary Leadership Award in Performing Arts from the Museum of the African Diaspora (MOAD) in San Francisco, the 2015 Carney Awards, the Lifetime Achievement Award from Chase Brexton Health Care in Baltimore, 2015 Honoree at the Grand Performances Gala in Los Angeles, the 2016 SweetArts Performing Arts honoree from the Contemporary Arts Center in New Orleans, the National Urban League’s 2017 Women of Power Award and the 2018 Bob Marley Award from AFUWI (American Foundation for the University of the West Indies). In addition to her prolific acting career and advocacy, Pounder has been extensively involved with the arts as a patron, collector, gallery owner and museum founder. Originally from Georgetown, Guyana, Pounder’s collection consists of Caribbean and African artists and artists of the African Diaspora. Her collection is heavily concentrated in the area of Contemporary Art but also includes traditional African sculptures. 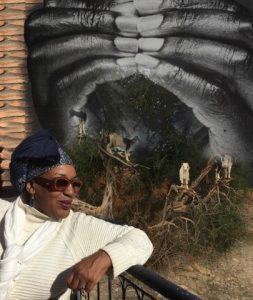 In 1993 Pounder and her husband, the late Boubacar Koné, founded and built the Musée Boribana, the first privately owned contemporary museum in Dakar Senegal, which they gifted to that nation in 2014. Pounder’s personal collection contains over 500 works of art, many of which she has generously loaned to Xavier University for a series of exhibitions.